The patient teacher, a photo by The Bacher Family on Flickr. Daniel's entry for the Science Fair was "Electrified Liquids," looking at the relative conductivity of electricity in various liquids (distilled water, salt water, sugar water, vinegar, lemonade, and milk). 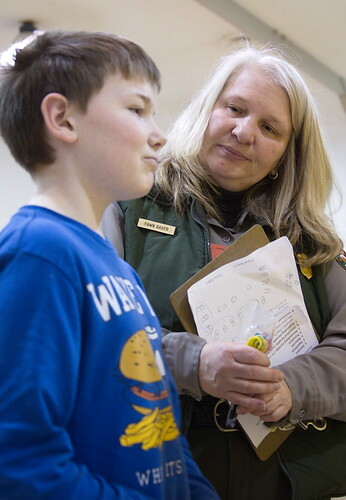 Several of the rangers from Mount Rainier National Park got to serve as judges, which meant that we got to talk to all of the students about their projects, listen to their presentations, ask them questions, and give them feedback about their work and their scientific method. Here, Daniel mulls his answer to a question posed by Education Specialist Fawn Bauer. I love the low angle of this image, and the intent looks on both faces. Daniel really looks like he's thinking hard, and Fawn's face is so patient and supportive. I'm pleased with the lighting, too -- so tough to get right in the gymnasium, especially with Fawn's pale blonde hair. The tradeoff, due to the low light, was a narrow depth of field, meaning I had to choose one face or the other to be in focus; the whole look of the image would be different depending on that choice. I like the choice of Fawn's face in this case -- hers is the one you can see the most of anyway, and she's definitely the primary actor at this point in the interaction.